Whether you’re mowing the ditch along the highway, or looking for assistance with crop residue, we have a mower for you. Flaman offers a line of commercial and farm mowers from Schulte, a brand known for its tough and dependable product. Save fuel and daylight with the FX 742, the world’s largest rotary cutter with a width of 42’. Despite its incredible size, this mower can easily fold to a 3-meter transport width thanks to its unique 5-plex design. The Schulte 5026 can handle everything you throw at it, from light bush to corn stocks and wheat stubble with its a 26’ cutting width and Fixed Knife shredding technology. Additional features include 1000 RPM driveline, 2-piece replaceable skid shoes on wings, and hydraulic phasing cylinders for level lift. The FX 520 boasts a 5-rotor design that optimizes cutting and increases productivity while delivering even distribution. 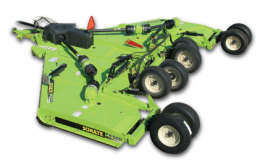 Schulte’s FX 318 is the first 18’ flex wing mower. This unit is safe and easy to transport due to its narrow transport width and can be run with the same HP as most 15’ flex wings. Other models we provide include the XH 1500, XH 100 and FX 1800. 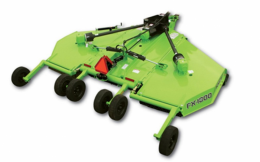 Both the XH 1500 and XH 1000 are compatible with the FLX 1510 Flex Arm, an attachment that allows you to remain safely on the road, while your mower cuts the ditch slope. The Flex Arm can also be extended or retracted so you can easily avoid obstacles while maintaining your straight path. The Eliminator, a chemical application spray kit, is another tool compatible with the XH 1500 that allows for precise one pass brush and weed control. Lastly, we have the XH 1800; this model features and 80-degree CV shaft for smooth power transmissions during tight turns which mean less rattling and more comfort for you. We understand that maintaining your land is incredibly important – and time consuming. Our selection of Schulte cutters can help, along with a wide variety of additional farm implements that can save you time. Our team of Ag Experts, located at our 9 locations throughout Western Canada, will get you connected with the best equipment for your farm.